Henrik Ibsen was born in 1828 in Skien, in the south of Norway. When he was fifteen, his father sent him to the small provincial town of Grimstad to become an apothecary's apprentice. During this time time he began to write poetry, and learned Latin in preparation for applying for university. After six years in Grimstad he moved to the capital, Christiania (later renamed Oslo). He published his first play, Catiline, under the pseudonym Brynjolf Bjarme, soon followed by The Burial Mound, Ibsen’s first play to be produced. 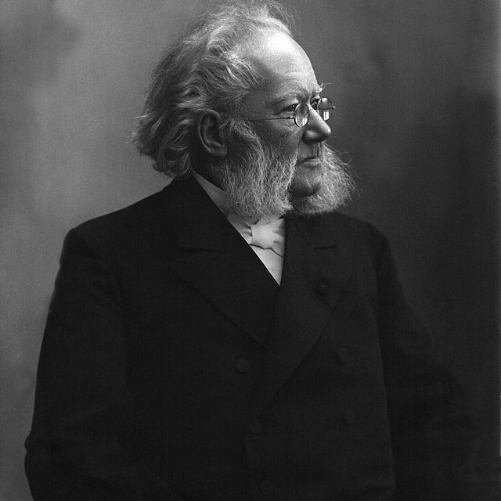 In 1851, Ibsen moved to Bergen, Norway to become an assistant at the Norske Teater, which was an important apprenticeship for his development as a dramatist. He wrote and staged plays for the theatre, as well as directing, thus gaining insight into all aspects of theatrical production. He moved back to Christiania in 1857 to become the artistic director of the Norwegian Theatre and married Suzannah Thoreson. Dissatisfied with Norwegian politics and his lack of success as a writer, Ibsen moved his family to Italy in 1864. In 1865, he published what is considered his first major work, Brand. Ironically, this play was a great Norwegian success and earned him a state stipend and financial stability. His success continued with Peer Gynt, a fantastical verse drama for which Edvard Grieg composed the music. Ibsen moved from Italy to Germany in 1868 and began work on his first contemporary realist drama The Pillars of Society, first published and performed in 1877. _A Doll's House _followed in 1879, along with Ghosts in 1881, and The Wild Duck (1884). Late in his career, Ibsen turned to a more introspective drama such as as Hedda Gabler (1890) and The Master Builder (1892). Ibsen completely rewrote the rules of drama with a realism that was to be adopted later by writers such as Anton Chekhov. He died in 1906 after a series of strokes.